Len Coppola began volunteering at NativityMiguel about five years ago, although if you observed him in action, you’d guess it had been much longer. 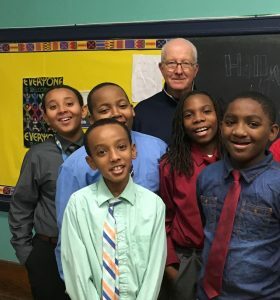 Len has a natural connection to the school’s mission and work. He first became involved with the school through Father Durkin, whom he met through the Southtowns Invitational Track League. 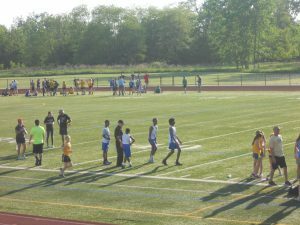 NativityMiguel students compete—and win!—at these track meets often. Len has been involved with the league, including as a member of the Board of Directors, for more than 30 years. Len’s primary role with NativityMiguel is as an after-school volunteer on the St. Augustine Campus. Beyond offering homework help, Len tries to be a mentor to the students. In his words, “If you can pull a kid aside and give them a word of encouragement, it really helps.” Len hopes he can help students see “the big picture.” He wants them to know that there’s more out there than what they immediately see—that there’s a lot coming, in 15 and 20 years. Len recognizes that most NativityMiguel students come from tough homes and neighborhoods. He wants to help them believe in themselves. When asked what keeps him coming back year after year, Len says without pause, “The teachers and the kids.” Len is taken by the teachers’ efforts: he sees them as selfless and calls their dedication “infectious.” He sees how hard they work and he knows that, like all teachers, they aren’t paid enough for their efforts. He finds their work inspiring. For Len, the most rewarding part of the year comes at graduation, when the students are all dressed up in their tuxes. In his words, “They’re beaming because they understand theyaccomplished something. And they begin to understand the difference between pleasure and happiness. Happiness comes from accomplishing things.”Len’s motto is simple: Those who give sunshine away to others can’t keep it from themselves. About his volunteering, he says he does it because he “gets a thousand times more out of it” than he gives. And this, he says, is the NativityMiguel way. Our 2018 Annual Fund page and donate!